Boil the kettle. Put the sweetcorn into a bowl and pour over the boiling water, leave for a minute or so for the sweetcorn to defrost. Drain and Set aside. Crack the eggs into a bowl and beat. Add the soy sauce and hot sauce and season with salt and pepper. Sprinkle over the plain flour and whisk to combine until there are no lumps. Add the coriander stems, garlic, spring onion and sweetcorn to the batter and stir thoroughly. Heat a large frying pan and spray with oil. Add heaped tbsps of the batter into the pan, spacing them out well. 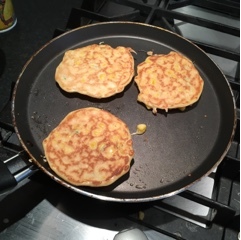 Cook the fritters for 2-3 mins until well browned underneath, then flip them and cook the other side. Repeat with the rest of the mixture. While the fritters are cooking make the dipping sauce. Put the soy sauce and lime juice in a small bowl, add the sugar or honey and stir until completely dissolved. Add the chilli flakes and garlic and stir to combine. Serve.